Observing the ongoing cyber discussion whether we currently live in an inflationary or deflationary environment I hope I can add a little more than my 2 trillion cents. Yes, we experience a lot of inflation these days! Yes, we experience a lot of deflation these days! No, there is no inflation these days! No, there is no deflation these days! Let these four arguments sink in for a second before you continue reading or - god beware - you surf to another blog for orientation in these messy times. All 4 opinions are both right and wrong at the same time. It mostly depends on the interpretation of these 2 nine-letter words (the third bad one is "recession") that have been slowly descending from discussions among economists - 99% of whom did not correctly forecast the current economic mess - into heated talks on the tables around me in my favorite Viennese lunch joint with less and less customers every week - that raised its prices by 5.4% within a year. As a general principle I prefer to follow the Austrian school of economics that defines inflation as the expansion of money supply - which has been exploding on a global scale while the economy contracts in almost all countries that publish these figures correctly. 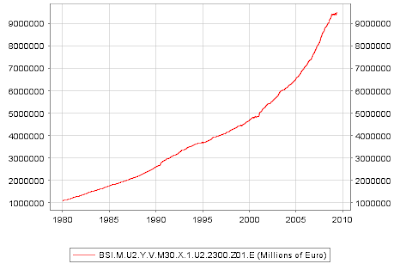 GRAPH: Nominal M3 growth in the Eurozone. Remembering an old rule of thumb from the German Bundesbank, undoubtedly the best inflation fighters in the second half of the 20th century, economists there subtracted GDP growth from M3 growth to arrive at the true rate of inflation. If I follow this rule with the European Central Bank's (ECB) M3 data series - find a handy overview of key Eurozone figures here - I arrive at a true inflation rate of 7.4% as of April 2009. Chart courtesy of ECB. 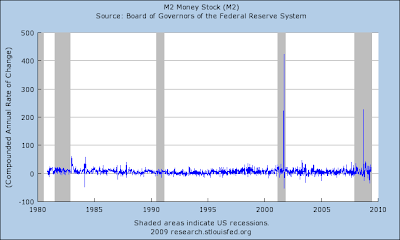 The Federal Reserve stopped publishing money supply M3 figures - the broadest monetary aggregate - well before M3 ran into the 2-digit area. Luckily shadowstats.com has filled the void, calculating M3 with an error margin of 0.3%. The other attempt to define inflation is to derive it from rising prices for services and goods. Taking two recent statistics from the EU's statistical office Eurostat, I discover a big discrepancy: While the flash estimate for annual inflation for May arrived at 0% (PDF) on May 29, Eurostat had released alarming figures on living conditions in the EU, headlining "One third of the EU population could not afford an unexpected expenditure in 2007" that also said that 7% of EU inhabitants were already in arrears on their utility bills. Looking at my own energy bill I notice that natural gas for heating my (badly insulated) residence has become about 25% more expensive despite natural gas retreating from $13 to $3 on futures markets since its historical highs in 2007. Looking at the other bill of the day I see my chimney sweeper has raised his fees by some 18% in the last 6 months. I would not exactly call this deflation. Keep in mind that consumer price indices have been changed by statistics offices in order to keep index-bound pensions and with it nations' expenses low. But, YES, there is a lot of deflation in this world, as all owners of stocks or real estate have sadly found out in the past 2 years. Take the market index chart of your choice or compare your house/flat price with that from a year ago and there is hardly an exception to the newly rediscovered concept of asset price deflation. Asset price deflation is a direct result of commercial banks' policies. As we have regressed from a savers society into a debtors society on a worldwide scale asset prices are heavily influenced by banks' willingness to lend money for purchases of asset papers (stocks) and real estate or other things. In one short sentence: If banks don't lend to buyers, your theoretical net worth development will turn south. As an additional note I want to remind you that we have not evolved very much since medieval times. As the majority of the population was then paying a part of their earnings to the count or king it nowadays has the same plight towards banks. Buying a house or whatever else on credit does not make you an owner at an instant, but only puts you in the debtor's position until you have paid off your loan to the last cent. As a general rule for reading economic indicators do not fall for the trap of slowing relative (percentage) growth which is now widely used by bankrupt governments to paint a rosy picture. A slowdown in growth of an indicator does not mean it has reversed its development. This trick may work with overworked and underpaid financial journalists, but should not succeed with prudent investors who are willing to walk the extra mile of knowledge to protect their savings.